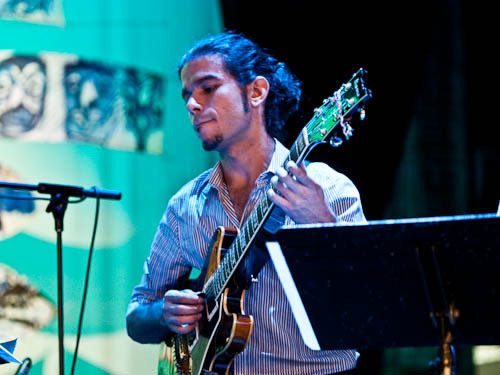 Richard Padrón is a guitarist and composer living and working in New York City. Having recorded and performed with such artists as Paquito D’Rivera, Chino Maurice, Michele Rosewoman, Lauryn Hill, Michael Phillip Mossman, Zé Luis Oliveira, Benny Reid, Antonio Hart, Will Calhoun, José José, Tony DeSare, Fabio Morgera, Francis Mbappe, Stacy Dillard and many other artists. Born in Havana, Cuba he grew up listening to Beny Moré, Fernando Alvarez, Tchaikovsky, Irakere and Billie Holiday which instilled in him a musical appreciation from an early age that would later provide a rich musical foundation to draw from. Richard began playing guitar and attended the prestigious New World School of the Arts in Miami, where he began formal conservatory training. Intuitively utilizing his musical heritage as well as the musical diversity Miami had to offer, he developed a unique style of both playing and composing. Drawing from many genres he breathes new life into the guitar and brings an inventive approach to his compositions. Richard Padron Trio at Terraza 7 on Friday October 30, 2015 at 9:30 pm. No Replies to "RICHARD PADRON TRIO"